We’d love your help. Let us know what’s wrong with this preview of A Sicilian Farewell by MaryAnn Diorio. The dream of a better life for himself and his family drives Luca Tonetta to the American Promised Land with his wife of five years, Maria Landro Tonetto, and their three children. But the new Promised Land is nothing like what Luca had imagined. Forced to live in a roach A young man, a new land, and a dream that threatens to destroy him, his marriage, and his mission . . .
To ask other readers questions about A Sicilian Farewell, please sign up. Last week I reviewed The Madonna of Pisano, the first book in The Italian Chronicles series, which I enjoyed immensely. 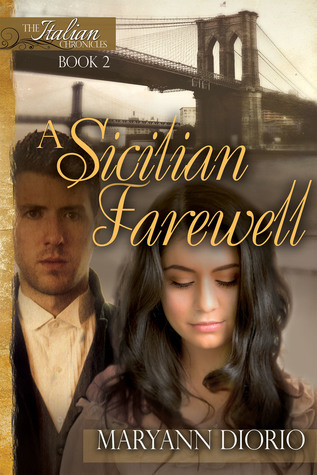 A Sicilian Farewell is the second book and it continues Maria's story. Although Diorio's writing was just as gripping once the story took off about one-third into the book, and I was emotionally invested in this book too, there were a few things that bothered me, which I'll get into further on. Maria and Luca now have a growing family of three children. Five years have passed si Last week I reviewed The Madonna of Pisano, the first book in The Italian Chronicles series, which I enjoyed immensely. A Sicilian Farewell is the second book and it continues Maria's story. Although Diorio's writing was just as gripping once the story took off about one-third into the book, and I was emotionally invested in this book too, there were a few things that bothered me, which I'll get into further on. Maria and Luca now have a growing family of three children. Five years have passed since the events that took place in the first book. Italy's economy is going from bad to worse and Luca's tailor business is failing as the inhabitants of Sicily leave for America in search of a better life. Finally, they decide to leave too, and Luca is especially happy for he believes this is God's calling for him to preach the Gospel in America. This is very much a Christian immigrant story. The hardships they face in a new land so vastly different from their homeland makes their life overwhelming and difficult as they try to adjust to their new life and circumstances. This was especially true of Maria. I empathized with her so much! Diorio captured this element of the story very well. My parents are both Italian immigrants and I've heard countless stories of how difficult and different life was when they first arrived in Canada. My mother left all her family in Rome and then ended up doing long hours in factory work. I also remember translating for my parents when they went to my school or my grandmother to the doctor. I enjoy immigrant stories and I really enjoyed this theme in A Sicilian Farewell. This is also much more Luca's story than Maria's as he struggles with his decision to uproot his family and subject them to a hard life as immigrants so that he can fulfil his ministry. Luca is a godly man and his whole life revolves around doing God's will. His faith is strong and he believes he is doing the right thing. I could understand that Luca was a pious man, but sometimes his moralizing dialogue and behaviour irked me. He was a young man who spoke like a 60-year-old to his wife. There was no passion between them except for the ministry. He never misspoke, or got angry or frustrated. I had a hard time believing he was Italian! Even the apostle Paul and Barnabas got angry with each other and had a falling out. (Acts 15: 36-39) Sometimes I just wished he would have showed Maria his true feelings as a husband rather than just preached or prayed. He worked a gruelling job with 16-hour days, lived in a one-room rat-infested tenement building, was accused of a crime, spent considerable time in jail and yet this did not seem to affect him much. It was almost too good to be true. Another thing I don't believe to be realistic is insta-faith. Two of the evil characters in the story accept Jesus and voilà, they are instantly changed. I have been in the ministry for almost 30 years and have preached Bible truths to people of all walks of life. It takes time and diligent Bible study to become a disciple of Christ and to transform one's personality. I would have liked to have Maria and Luca's inner struggles explored more about living through the situation of being found guilty of a crime, rather than the rushed ending of everyone praising the Lord even though some spent years doing horrible things, with no consequences, I might add. 'A Sicilian Farewell' is the story of a man of deep faith who leaves his home in Sicily to travel to America so that he can better provide for his family and also answer God's call to preach. Luca Tonetta feels that God wants him to take His Gospel to the people of America, the New Promised Land, and Luca knows that he must obey. After arriving in America with his wife and three children, Luca begins his new life working as a tailor, the trade he had mastered in Sicily. It is soon apparent that 'A Sicilian Farewell' is the story of a man of deep faith who leaves his home in Sicily to travel to America so that he can better provide for his family and also answer God's call to preach. Luca Tonetta feels that God wants him to take His Gospel to the people of America, the New Promised Land, and Luca knows that he must obey. After arriving in America with his wife and three children, Luca begins his new life working as a tailor, the trade he had mastered in Sicily. It is soon apparent that America is not the Promised Land that he had imagined. His family's living conditions are very discouraging and Luca faces many hardships and prejudices because he is an Italian immigrant. None of this, however, alters his belief that his Heavenly Father will provide and Luca still feels that God's will must be done. Fervent prayer helps Luca resist the sexual advances of a female co-worker and even when he is convicted of a crime that he didn't commit, Luca continues to pray, forgive and forget the trespasses against him. It is because of this willingness to forgive that two of his accusers accept Jesus Christ as their Savior. Luca Tonetta is truly a man we all should strive to be! MaryAnn Diorio has written a story that will encourage readers to listen closely to God's voice; inspire them to pray more fervently; remind them that even though God doesn't promise a life that is easy, he does promise a life that is worth living. 'A Sicilian Farewell' is a book of fiction but Diorio has used events from her personal family history as inspiration and she also uses scripture throughout the book to enhance the plot and share with readers God's Plan of Salvation. I highly recommend this story that illustrates love, forgiveness and grace, both human and divine. Following this story from Volume One has been so much fun! All of the characters, who have migrated from Italy in the late 1800’s, feel like old friends. The plus for me is that it gives a little history of my own heritage, as I am Italian through and through, and my grandparents were immigrants. The first book took place in Sicily, but now Luca and Maria Tonetta take their family to the United States in search of a better life. Luca is a tailor whose business has been failing, as many in Italy w Following this story from Volume One has been so much fun! All of the characters, who have migrated from Italy in the late 1800’s, feel like old friends. The plus for me is that it gives a little history of my own heritage, as I am Italian through and through, and my grandparents were immigrants. The first book took place in Sicily, but now Luca and Maria Tonetta take their family to the United States in search of a better life. Luca is a tailor whose business has been failing, as many in Italy were at that time. His hope is that, although he has been offered a job with a clothing manufacturer in Brooklyn, New York, someday he will be able to open a new shop. But his greatest goal was to follow the lead of the Lord and preach the gospel there. The problem with the whole situation is that the pay at the shop where he works is not enough to support a family and they are forced to live in the tenements. Although not as lavish as the beautiful villa, Bella Terra, that had been Maria’s home all of her life, they did make many friends among the other immigrants. A Russian woman at the shop takes a liking to Luca and continually tries to seduce him, but his strength in the Lord prevails. Later, money from the safe of the shop supervisor goes missing and is eventually found among Luca’s work supplies. I’m going to stop there and leave the rest to your imagination. I hope it forms many questions in your mind that you want to find the answers to. This book is an enjoyable, heart-stopping read. Some of it is based on the life of the grandmother of author, MaryAnn Diorio. Just that makes it more tempting to pick up. If that’s true for you, then you should. Following God’s call for his life, Luca and his family immigrate from Italy to America. Luca’s decision to do so is a difficult one. His wife’s heart will always be with her beloved Bella Terra and he is ripping her from all she knows. However, due to political circumstances, Sicily is struggling and Luca is barely eking out a living. From Sicily, America seemed like the promised land, one of great opportunity for his business and growth. But once there, Luca is faced with struggle, strife, and Following God’s call for his life, Luca and his family immigrate from Italy to America. Luca’s decision to do so is a difficult one. His wife’s heart will always be with her beloved Bella Terra and he is ripping her from all she knows. However, due to political circumstances, Sicily is struggling and Luca is barely eking out a living. From Sicily, America seemed like the promised land, one of great opportunity for his business and growth. But once there, Luca is faced with struggle, strife, and great hardship. I love the undercurrent of faith throughout Maryann Diorio’s writing. Luca’s faith is what keeps him going, even in the direst of circumstances. Book 2 of this series does not disappoint! These characters have found a place in my heart and I cannot wait to continue their story in Return to Bella Terra. I fell in love with the dramatic characters in Book One 'The Madonna of Pisano' and knew I must read the rest of their intriguing story. It broke my heart to read of the deplorable conditions immigrants had to endure while seeking a better life in America. Not only racism, but rat-infested tenements, long, tedious working hours, and an intense yearning for the beautiful land they left behind. I can honestly say I could not have endured it and would have been on the next ship home! Maria and Luca I fell in love with the dramatic characters in Book One 'The Madonna of Pisano' and knew I must read the rest of their intriguing story. It broke my heart to read of the deplorable conditions immigrants had to endure while seeking a better life in America. Not only racism, but rat-infested tenements, long, tedious working hours, and an intense yearning for the beautiful land they left behind. I can honestly say I could not have endured it and would have been on the next ship home! Such lovely writing--and an even lovelier story! Author MaryAnn Diorio takes her readers on a courageous journey, from the ancient romance of the Old Country to the perils and possibilities of the New Country. Well developed characters and a story that will stay with you long after you've finished this enjoyable read. This was a very realistic story of a family considering leaving Sicily for America and the challenges and opportunities they faced along the way. Their faith throughout the journey was inspiring the author did a wonderful job of bringing their daily struggles to life. I came into this series at book two and would like to go back and read the first book, because the characters were so enjoyable. I love this story that has continued from Book 1 and will continue in Book 3. A family and how they came together in their home country and then takes a chance for a better life in America. There are many challenges that Luca and Maria have to face and with God they continue to hold onto Him and through all they know "God will never fail". Looking forward to reading Book 3. Dr. MaryAnn Diorio is a widely-published, award-winning author who writes riveting and compelling fiction that deals with the deepest issues of the human heart. She also writes picture books for children. MaryAnn holds the PhD In French with a concentration in Comparative Literature from the University of Kansas and the Master of Fine Arts in Writing Popular Fiction from Seton Hill University. She h Dr. MaryAnn Diorio is a widely-published, award-winning author who writes riveting and compelling fiction that deals with the deepest issues of the human heart. She also writes picture books for children. She has been married to her husband Dom, a retired ER physician, for 49 years. They are the blessed parents of two amazing adult daughters, parents-in-law to a fantastic son-in-law, and grandparents to six wonderful, rambunctious grandchildren. Theirs is a closely knit family who enjoy spending time with one another over a good cup of coffee or a delicious Italian meal, usually cooked by Dom, a master chef. When not writing, MaryAnn loves to read, paint, play the piano and cello, and make up silly songs with her grandchildren. She intensely loves people and had a life coaching practice for 12 years in order to help her clients find their true purpose in life.